This Ceramic Iridescent Knife will stay sharp, never rust, and works great in the kitchen, backyard, or wherever else you might need it. The 4" blade is paired with our most ergonomic 4" black ABS handle. The total length of the knife is 8", and the width is 1" at the widest point. This knife is super sharp and will cut through nearly everything! Looks great, lightweight, and rustproof! Get yours now! Lightweight, Sanitary, and Ultra Sharp. 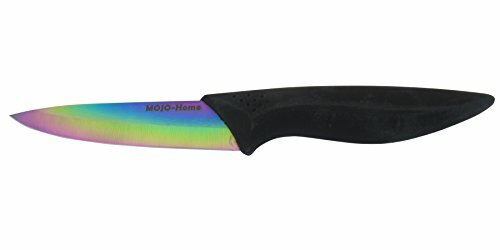 MOJO LLC offers an exclusive manufacturers warranty for 60 days with this knife. This warranty is exclusive to sales through MOJO only. Purchases made from unauthorized resellers are not eligible for this warranty. If you have any questions about this product by MOJO-HOME, contact us by completing and submitting the form below. If you are looking for a specif part number, please include it with your message.